Yuan Chang Tsay Industry Co.,Ltd. Traditional filter (the filter barrel) function only using backwash or manual cleaning filter core, can not effectively prevent the clogging of filter core. After a period of using time, the water production decline, filter clogging is bound to stop frequently to clean filter or replace the filter, the cost of long-term use is very high. Yuan Chang Tsay develops Intelligent Differential Pressure Precision Filter, minimum accuracy can reach filtering 10um (size of approximately macromolecules). Filters are made of around 3 to 5 layers of sintering, the thickness reach 1.5mm or more, be able to bear high pressure and no need to replace the filter. Using a pressure sensor, when the pressure is increased will automatically clean the filter and discharge blocking material at the same time. When self-cleaning filter, water production only slightly reduce (approximately 50L/Lot), without downtime, improve performance, and reduce the cost of labor and replace the filter. ◈High precision and stable water filtration. ◈Pressure difference through the electronic control, timer control, automatic backwash, no personnel to operate. ◈Backwashing without stopping produce water, continuous operation, stable and reliable. ◈Simple device structure, fewer parts, the low cost of operation and maintenance, easy operation and management. ◈The wide usage area and applicable to different water source for filtration. ◈Pure water, reverse osmosis, ion exchange pretreatment. ◈The central air conditioning cooling water filter. ◈The swimming pool cycle water filtration. 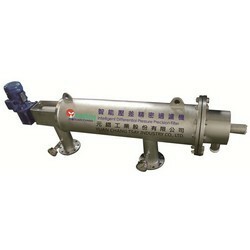 ◈The municipal green spray, agricultural spraying filter. ◈The car wash cycle water filtration. ◈Groundwater, surface water, rust filtering. ◈The iron and steel, petrochemical, paper making, metallurgy and other industries cooling water filter. ◈Washing Pump and Sewage Pump are optional , please contact us directly. ◈The above data depends on the actual treating method and the pollution condition of the waste water. ◈Yuan Chang reserves the right of modification and accepts customer’s special order.